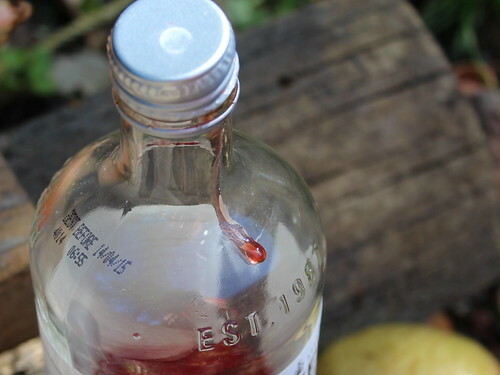 I admit that I bought this Apple & Pomegranate Syrup partly because I love the shape of the bottle. I have a ‘thing’ for interesting and unusual glass bottles – they make lovely vases and are very good a cluttering up my limited cupboard space. I won’t go into detail about the four or five large boxes of antique bottles that my Uncle saved from my grandparents place – they have been safely wrapped in newspaper for about ten years – awaiting a lovely display unit in the living room. As the Anster doesn’t share my passion for glass, the display unit is nearer the bottom of the ‘want’ list. And I suppose I do agree that a proper laundry would be more useful that a display shelf for obscure bottles. More useful but less exciting. Another ‘thing’ I have is drinking hot drinks. I don’t particularly like tea – it smells so inviting but tastes dusty and ordinary. But I have developed a strong attachment to coffee. When I have had my daily quota of coffee (the quota has developed from the idea that too much coffee isn’t good for me and I agree that moderation is the key to a good diet), fruit syrups fill the gap. They are syrup so they do contain sugar, and once again, moderation is the key. A hot apple & pomegranate juice is delicious. Make some delicious caramelised apples, serve with vanilla ice cream or fluffy pancakes and drizzle with apple & pomegranate syrup. Try Annabel Langbein’s delicious One-Pot Chocolate & Raspberry Cupcakes. Very good and easy to make and, did I say, very good?. Try an Apple & Pomegranate variation by substituting the raspberries with diced fresh apple or pomegranate seeds. 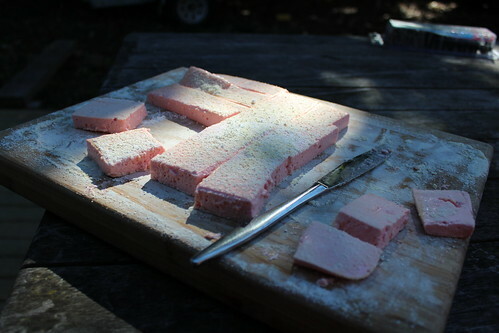 I made a variation on these Retro Marshmallows – stay tuned as my recipe needs a little bit more work before I am comfortable sharing it. I did take a photo though, tried to be all arty with the shadows. I made Apple Syrup Meringues this morning. Unfortunately we had a power cut while I was whisking in the sugar. The meringues are crazy cracked and a little, well more than a little, bit of a failure. I’d like to blame the power outage entirely, but I feel my recipe needs some attention. I have apples on the tree and pomegranates on the bush, so I thought I’d have a crack at making my own syrup. A lot of recipes & methods I researched began with juice whereas I wanted to start with the whole fruit. So I decided just to chuck some apples & pomegranates in a pot with a little bit of water and see how it turned out. 8 cups of apples and 2 cups of pomegranate seeds yielded 200ml of juice, and a large bowl of lovely pulp. Well, it is lovely pulp after I spent a good hour or two passing it through a sieve to get rid of those pesky pomegranate nibby things. Processing the juice into syrup, I ended up with some lovely rose-pink jelly as I boiled it a little too long. Oops. Will have to try that one again. 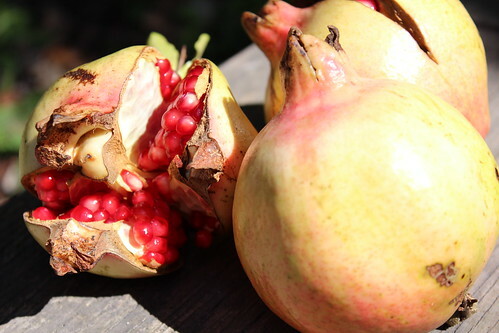 Speaking of Pomegranates – they grow well here in Gisborne. We have the hot summers required for good successful fruiting. 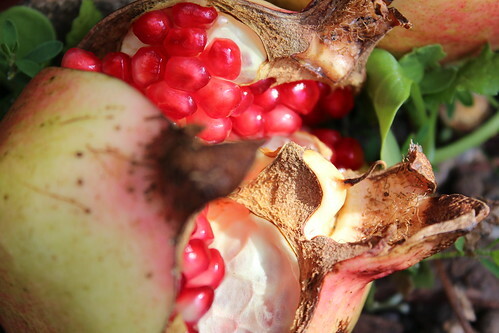 Pomegranates are an autumn fruit – ready in March & April. The taste bud jury in my mouth is undecided about Pomegranates – the sweet sharp flavour is appreciated but my teeth don’t appreciate the nubbly little pits. 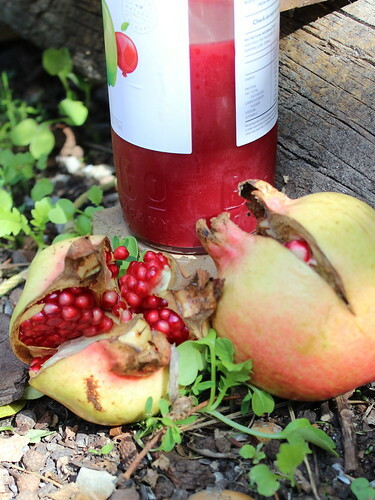 This entry was posted in Autumn, Product Review and tagged Apple & Pomegranate Syrup by Jo Dohrman. Bookmark the permalink.